Remediation with Thermal Methods has become a hot topic since steam injection, electrical conduction heating, and electrical resistance heating have been used in several successful projects. The most visible of these projects is the Visalia Superfund Project. 1,000,000 pounds of creosote, diesel and pentachlorophenol have been recovered there by injecting steam into an aquifer 120 feet underground. Less than one pound per day had been recovered in a pump and treat. The primary recovery mechanism at Visalia is vaporization of PCP, diesel diluent, and smaller creosote molecules (Figure 1). In addition, the hydrocarbons that dissolve in the water can be oxidized in a reaction similar to coal- gasification, i.e. oxidation with injected oxygen and hydrolysis by water. Many lessons can be learned by studying the Visalia project with a simulator like STARS, the Computer Modeling Group’s thermal finite difference compositional reservoir simulator. Simulators like STARS can differentiate between the DNAPL (Dense Non Aqueous Phase Liquid) produced as liquid and those components (up to 22) produced as vapor. In addition, competitive reactions like oxidation, pyrolysis or bioremediation can be specified for each component in the simulation. Including all mechanisms can help the team designing a project to understand what is important and how to best plan the remediation project. In the case of Visalia, the “Hydrous Pyrolysis” reaction can be modeled either as a chemical reaction between DNAPL and liquid water or as a reaction in water between DNAPL and dissolved oxygen. These reactions primarily occur during steam injection when the temperature is high. Thus, for a chemical reaction, producing without injecting steam (Soaking) is not productive. So, in Figure 1 the production increases during steam injection and virtually stops during the soak period. How the DNAPL is redistributed as it vaporizes can be seen in the figure below. Since the main production mechanism is vaporization, the DNAPL moves wherever the steam goes. 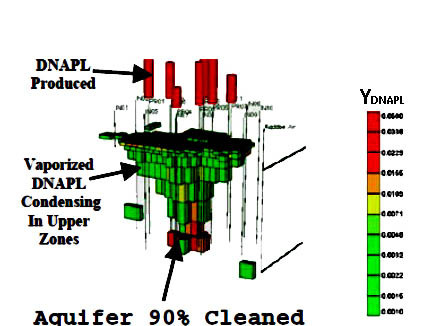 As the steam cools above the aquifer, or in low pressure zones around wells, the DNAPL can condense. A simulator helps us to know that this could happen before it happens. Changing well completions and configurations can then be tested to correct the problem. Use of simulation as a project design tool can only help to improve projects and reduce cost. The relative value of oxidation via “Hydrous Pyrolysis” can be seen in the nexy figure where injecting extra air with the steam does not increase recovery substantially because recovery of vaporized NAPL decreases. However, the lower steam injection rate that results from increased air-coinjection could reduce the cost of the project since low- pressure compressed air costs much less than heating a site. The overall efficiency of projects like Visalia can be improved substantially by using a sophisticated simulator to help select placement of wells. The last figure shows that adding either a central injector or producer to the project could have cut the time to recover the DNAPL by 50%. The production can be improved because the original design allowed DNAPL to be concentrated between wells. Adding a well where the DNAPL concentrated corrects the problem. The Visalia work has been presented at many seminars, as an AIChE paper at Atlanta in March of 2000, and as J. of Hazardous Materials 92, (2002) 1-19. Copies of that paper are available upon request. Visalia should be an inspiration for many successful thermal remediation projects. If you would like to discuss in situ thermal remediation by steam, conduction or electrical heating, please contact MK Tech Solutions.